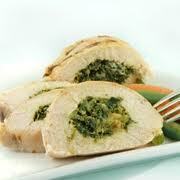 A delightful spinach stuffing, flecked with red pepper and onion, highlights this moist and tender entree. The chicken is drizzled with a silky mushroom sauce, making an attractive main dish for a special-occasion meal. Variations: Top with marinara sauce recipe. Modifications: Brush chicken with MCT OR COCONUT oil, add marinara sauce. Bake until brown and bubbly.